This is the first PIANC report specifically focused on the topic of inflatable gates. It is also the first report for owners and operators focusing on the design, fabrication, construction, operation and maintenance of inflatable gates. A previous report of InCom WG 26 focused on the ‘Design of Movable Weirs and Storm Surge Barriers’. 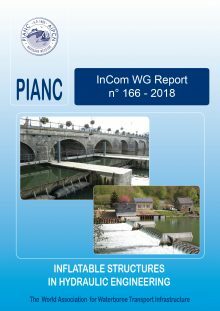 The report of WG 26 [PIANC, 2005a] presented a comprehensive review of the modern technologies, design tools, and recent research used to design and build structures controlling water level and flow in rivers, waterways and ports (for navigation and flood protection). It briefly introduces rubber gates (also known as rubber dams, rubber weirs or inflatable dams) and steel-rubber gates (also known as pneumatically actuated gates or Obermeyer gates). This report of WG 166 is useful and complementary to the former report. It is also linked to the report of WG 138 – ‘Mechanical and Electrical Engineering – Lessons Learnt from Navigation Structures’ [PIANC, 2014b], where drive systems are described which are utilised in navigation structures and storm surge barriers. Based on the terms of references of the Working Group the objective of the report is to discuss the benefits and disadvantages, make recommendations, develop practical solutions, provide a general methodology for analyses and design, gather experiences and expert analysis on relevant problems and show the application range of inflatable gates. The report should help designers and operators throughout the world and provide guidance to develop and operate safe and economical inflatable hydraulic structures.